The funniest thing has happened lately, and I just LOVE it. Perry and I have started to have our first few “conversations.” It is truly the neatest thing for me. Though I am really sad that my “baby” is getting to be such a big boy, it is so much fun seeing him learn and discover new things. 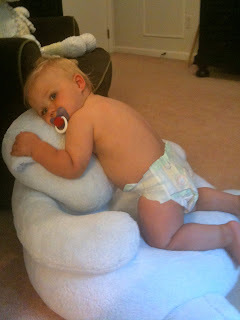 It first started last week, when I was looking all over the house for Perry’s passi. We are really bad about leaving them at his Grandmommy and Grammie’s houses, and I only had one at our house this particular night. It was about 9:30- past bedtime- and I was getting pretty frustrated. Finally, I looked at Perry and said, “Baby bug…Where is your passi? 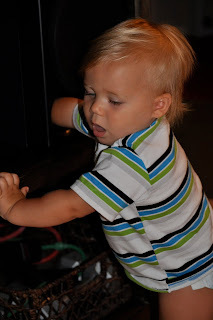 ?” And he grinned from ear to ear, then ran over to a speaker we have in our entertainment center. (This speaker, for whatever reason, has a hole large enough for Perry’s little hand to fit in and runs all the way to the back of the speaker.) He reached his hand in, and I thought he was just playing around. But then he plopped out his passi, held it high in the air, all while smiling like crazy. Then he giggled and popped it right into his mouth. Perry reaching into the speaker to get his hidden passi! Now, I know that this might sound crazy, but I was beyond excited. I felt like we had truly just experience our first “conversation.” Although on Perry’s end, there wasn’t much talking, there definitely was communication. He completely understood what I was asking him, AND he helped me out because he knew where his passi was!! CRAZY!! · He can now officially ask for a bottle- I’m completely ignoring the ole sayin’ that if they can ask for it, you take it away…..He’s pretty good at simple sign language, so now he will sign “eat” while saying “baba” (bottle). · He can also call my Grandmommy and Grandaddy’s dog, who funny enough, has the name Einstein. · Whenever he gets told “no-no,” he will look at you, then shake his head “no” feverishly. If he knows he’s not supposed to do something, a lot of times he will start to do it, then look at you and violently shake his head “NO!” then run away from it… SO funny!! Love that post! So fun! I'm impressed about the passi!! He sounds like a very smart cookie! :) I love when curran shakes her head no. It is so cute! Thanks! I feel like sometimes he is too smart for his own good. I'm definitely going to have to keep my eye on him! !